Zune Lotoo-Annihilate F-A1 bad kid is a tool specially designed for military fans, tactical zealots as well as jungle explorers,etc. Shove head: High-carbon stell, sheet metal process, high hardness and durable. Shovel point: Triangle concave design, can decrease resistance effectively when dig and shovel. Handle: aircraft aluminum with surface oxidation, light weight and high intensity. delicate pattern design can increase friction bewteen hand and handle, with anti-skid function. Avoid injury when using. Ruler: With gauge length of 7 cm, you can make accurate measurement. Outdoor handknife/handsaw: Multifunctions, can scale a fish, cue meat, greatly enhance survival ability, detachable. Survival whistle: Blow it when encounter danger or need help in outdoor, detachable. Camera support: Screw-tightening, detachable, can match with digital camera and DSLR. Sturdy & Durable – This folding shovel is made of high-carbon steel which is high-strength and wear-resistant. It is a sturdy and durable entrenching shovel suitable to be used as camping shovel or hiking shovel. Each components of this shovel is subjected to abutting joint strength test and flexibility test. And assembled with the self-developed screw fasteners, which can rapidly lock the angle of the shovel. Technology – Sheet metal technology, made of improted high carbon steel, HRC 48-53.The handle is made of aviation aluminum, carved with diamond pattern for better anti-skip. Each components is subjected to abutting joint strength test and flexibility test. Multifunctional – All-in-one Functions of zunelotoo shovel: Dig, Trench, Chip, Shield, Cut, Scale, Make Fire, Hammer, Climb, Case Opener etc. What a versatile hiking and camping tool for all outdoor lovers! 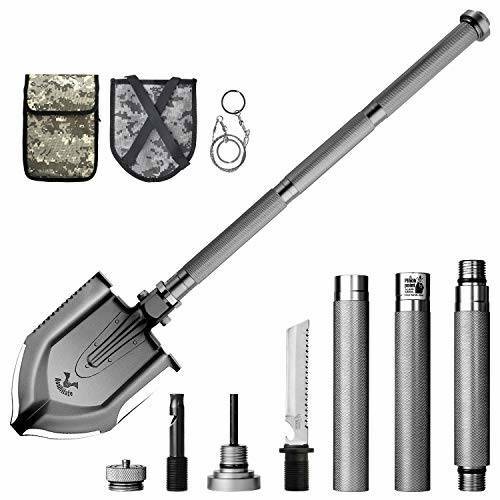 For daily use, this entrenching shovel can also be used as garden shovel, self-defence tool. Top shelf Used to chisel a car from recent ice storm after plows blocked it into the spot.Held up perfectly.